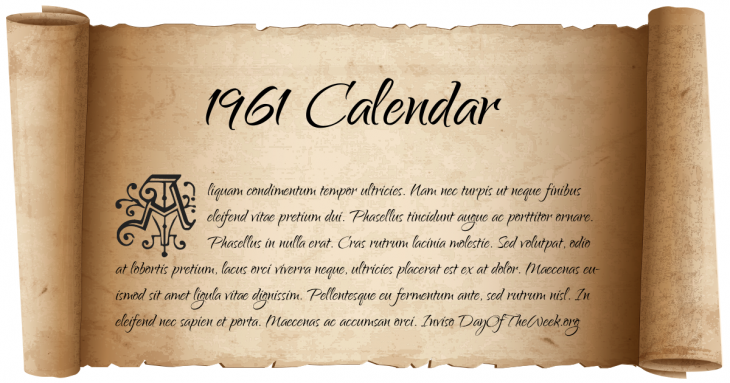 February 15, 1961 – New Year’s Day in Chinese calendar. Start of the year of the Metal Ox in Chinese astrology. February 16, 1961 – The DuSable Museum of African American History is chartered. April 8, 1961 – A large explosion on board the MV Dara in the Persian Gulf kills 238. April 23, 1961 – Algiers putsch by French generals. May 21, 1961 – American civil rights movement: Alabama Governor John Malcolm Patterson declares martial law in an attempt to restore order after race riots break out. May 24, 1961 – American civil rights movement: Freedom Riders are arrested in Jackson, Mississippi for “disturbing the peace” after disembarking from their bus. July 12, 1961 – Pune floods due to failure of the Khadakwasla and Panshet dams. Half of Pune is submerged, more than 100,000 families need to be relocated and the death tally exceeds 2,000. July 31, 1961 – At Fenway Park in Boston, Massachusetts, the first All-Star Game tie in major league baseball history occurs when the game is stopped in the 9th inning because of rain. August 10, 1961 – First use in Vietnam War of the Agent Orange by the U.S. Army. August 11, 1961 – The former Portuguese territories in India of Dadra and Nagar Haveli are merged to create the Union Territory Dadra and Nagar Haveli. Who Were Born On 1961?